K7 kineseograph measurements is the GOLD STANDARD in quantifying neuromuscular movement disorders. Many in the field of dentistry all recognize the limitations of radigraphic imaging whether it is tomography, ICAT, CBCT, CAT or MRI’s. MRI’s don’t quantify dyskinetic movement disorders or bradykinetic movement disorders. The neuro-muscular approach is about quantifying and validating function and dysfunction with data. It is evidently that objective documentation is the simplest determining factor in arbitrating conflicting subjective opinions. The question arises as to whether where one can see in these K7 graphs (called “scans”) at what point or position can one identify whether the disc is displaced and when is the disc and condyle reduced (recaptured)? (Below are some recordings (call “scans”) that show disc recapture and jaw movement positioning improvements). K7 Scan 4 – Habitual Rest (Vertical, antero-posterior and frontal/lateral sweep scan) over time – Left window. Right window shows K7 Scan 2 – Open and closing (Sagittal, frontal and velocity) mandibular movements BEFORE GNM orthotic treatment. This patient is a patient diagnosed with DYSTONIA. In these K7 jaw tracking recordings you will not be able to see if the discs are reduced or not. We perform other jaw tracking tests and recordings to see those features. These particular scans I posted show abnormal vertical, AP and frontal jaw position with dyskinetic movements during the patients resting period (left screen before treatment). The right top window/screen shows patients open and closing patterns with abnormal slow and jerky mouth opening and closing movements and slow down velocity patterns before GNM Orthotic treatment. Would you say that these are examples of “Movement Disorders” – abnormal and unhealthy. K7 Scan 4 – Habitual Rest (Vertical, antero-posterior and frontal/lateral sweep scan) over time – Left window. 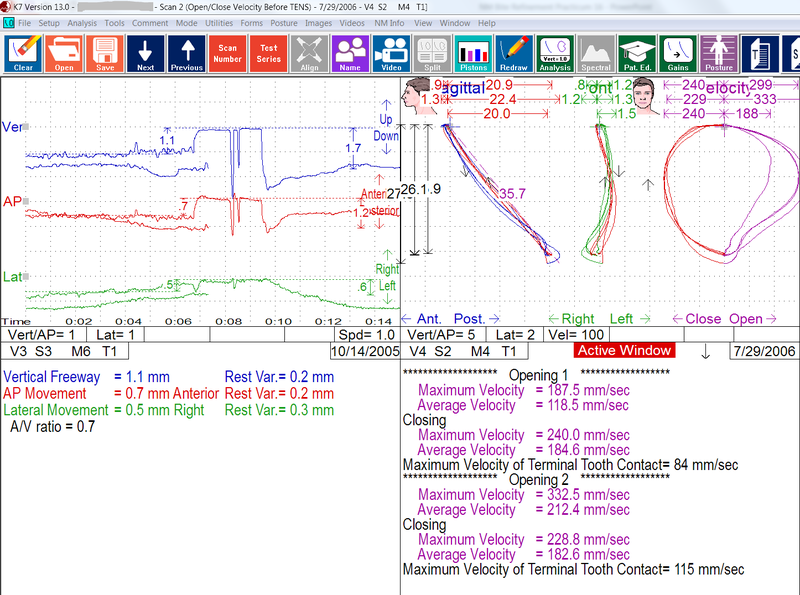 Right window shows K7 Scan 2 – Open and closing (Sagittal, frontal and velocity) mandibular movements AFTER GNM orthotic treatment. Improved resting mode and improved functional movements to CO. The screens/ windows above are mid progress recordings after orthotic treatment, but not the final, showing improved resting modes and definitely improved opening and closing velocity patterns (more rounded) without bradykinesia and or dyskinesia. Again this is quantifiable real time data of a patient with and without GNM orthotic as dynamic functional evidence. MRI is static and does not show this kind of data which is commonly missing in the understanding and treatment of TMD and neuro-muscular disorders. 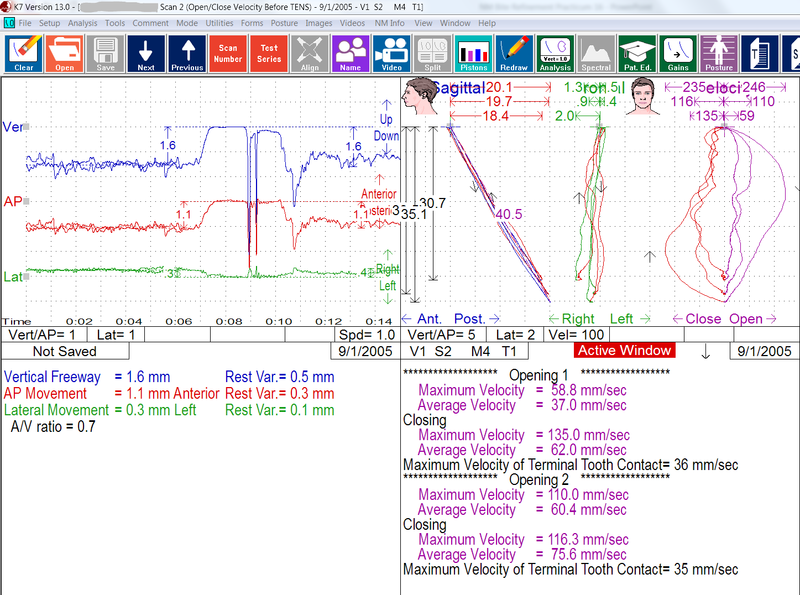 K7 Scan 5 – Sagittal and frontal Jaw Tracking with Myomonitor TENS BEFORE GNM orthotic treatment. Bite registration recording pf same patient above. Below is an example of a K7 jaw track in the sagittal and frontal/lateral views showing a posterior condylar positioned case as well as mandibular opening and closing to the right of mid sagittal plane relative to the more physiologic (normal) myo-trajectory (path of closure of the jaw). Black mark = my Myo-target where I took the bite registration using involuntary TENS to identify the reduced disc and improved condylar position. K7 data records habitual centric occlusion as well as myo-trajectory isotonic paths of mandibular positioning as well as voluntary open and closing movements as well as protrusive paths. It also shows unstrained and optimized disc recaptured and relaxed position. K7 Scan 4/5 – Sweep mode and Sagittal and frontal Jaw Tracking with Myomonitor TENS AFTER GNM orthotic treatment. Data confirming improved functional position with involuntary closure = voluntary closure path (where myo-trajectory is coincident with voluntary mandibular closure path) and disc reduction on the right TMJ after GNM orthotic treatment of same patient above. This data shows AFTER jaw tracking with GNM orthotic in patients mouth showing functional movements and improved positioning documenting improved and recaptured right joint disc recapture (reduction) observed and seen on frontal/lateral (green) as well as sagittal positioning (blue). Green lines show frontal jaw movements in the recaptured position. 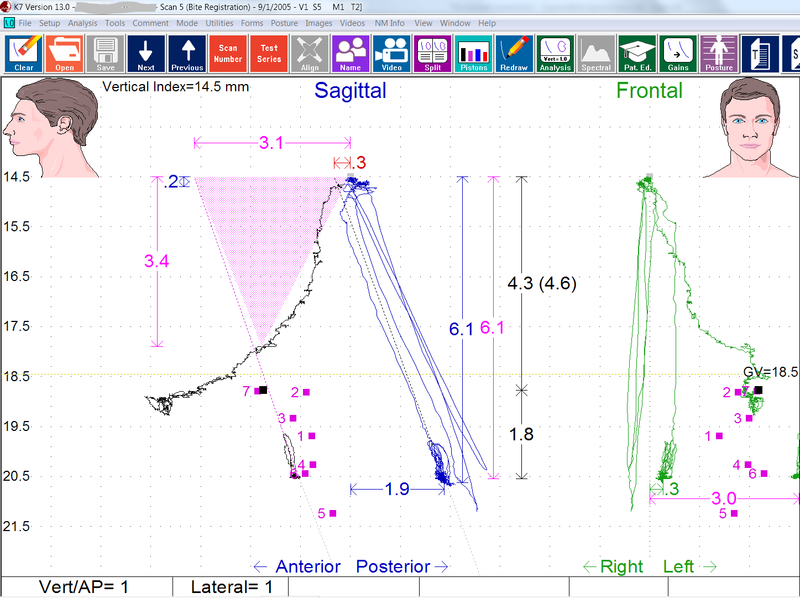 I have also recorded all on the same screen the habitual tracings of where the right condyle is not reduced (1.5 mm to the right of mid-sagittal plane) as evidence. 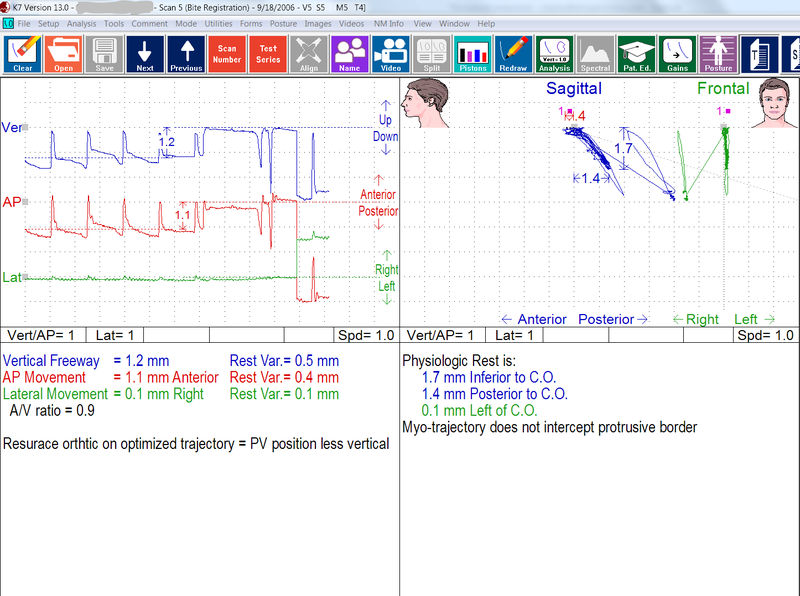 The habitual closing path is 2 mm posterior to the optimized myo-trajectory path. Patient reports no longer having clicking or popping in right TMJ, no longer ear congestion feelings and vertigo. She also displayed improved balance during walking and standing in an upright position. She also had better facial symmetry and facial balance. Your mandible can close on different trajectories (paths of closure) depending on the conditions of the TM joints (condyles/discs) and muscle tonus. If the disc are displaced the mandible will function posterior to where it would like to more comfortably me (anterior to pathology). If the disc is properly reduced (recaptured) and muscles are physiologically relaxed the mandible will open and close on the Optimized trajectory (seen below). 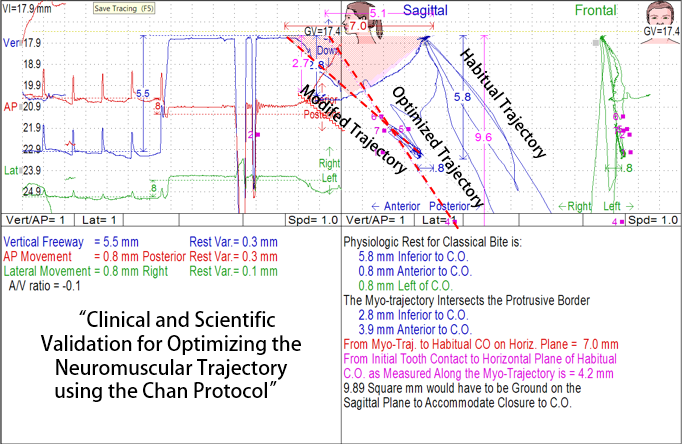 So NM clinicians do not always understand what optimization means (although they may use the term), but typically have not received the specialized trained that is provided at Occlusion Connections (with Dr. Chan the developer and creator of the Optimized Trajectory Protocol). The K7 (kineseographic jaw tracking instrument) is not about opening up bites. It is a very fined tuned instrument that measured mandibular positioning. It allows a trained dentist to know whether one should adjust the teeth or not to adjust the teeth in the existing habitual position. The pink triangle is a measured area at a very detailed level (1 square mm per square on the grid). That is why the K7 GNM doctors measure the AP and frontal trajectories to first see how much needs to be ground way…that is what the pink triangle represents…. Do dentists really understand it? If the pink triangle is 0.2 mm or greater the K7 user realizes this will be too much tooth amputation. If it is less than we know it is a good case to do coronoplasty and you don’t have to open up bites and increase the vertical…but if it is more, than the clinician needs to rethink the bigger picture of the case, the condition of the joints, etc. Consider how big is the pink Triangle on the K7 Scan 4/5. The blue lines represent the patients actually open and closing movements as well as the muscle relaxed positional movements relative to the habitual bite which is called CO or centric occlusion.